The Killers and the US President + the wives. 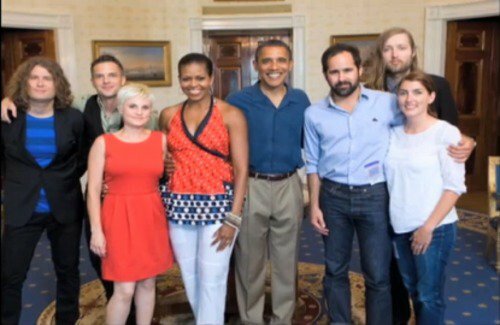 The Killers at the white house with President Obama, michelle Obama, Tana Flowers, and Lisa Vannucci. Wallpaper and background images in the The Killers club tagged: the killers white house barack obama michelle obama tana flowers lisa vannucci ronnie vannucci dave keuning mark stoermer brandon flowers. This The Killers photo contains workwear and vêtements de travail. There might also be pantalons longs, des pantalons longs, pantalon long, vêtements de loisirs, and chaussée. I'm assuming Tana was about 2 months pregnant in this photo. Yeah that makes sense. This is so cute! I love how Brandon is hugging Dave and not his wife!